The Obama administration will no longer employ the controversial term, but is the announcement really a significant policy shift? 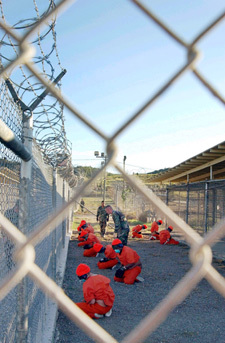 Detainees in orange jumpsuits sit in a holding area under the watchful eyes of Military Police at Camp X-Ray at Naval Base Guantanamo Bay, Cuba, during in-processing to the temporary detention facility in this file photo taken on January 11, 2002. The Department of Justice has just announced a significant break with Bush administration policy: It will no longer be employing the "enemy combatant" designation as the rationale used to hold suspected terrorists at Guantanamo Bay. Observers are still figuring out exactly what this will mean, but the Associated Press reports, "Obama still asserts the military's authority to hold prisoners at Guantanamo Bay. But he says that authority comes from Congress and the international laws of war, not from the president's own wartime power." In a filing today with the federal District Court for the District of Columbia, the Department of Justice submitted a new standard for the government’s authority to hold detainees at the Guantanamo Bay Detention Facility. The definition does not rely on the President’s authority as Commander-in-Chief independent of Congress’s specific authorization. It draws on the international laws of war to inform the statutory authority conferred by Congress. It provides that individuals who supported al Qaeda or the Taliban are detainable only if the support was substantial. And it does not employ the phrase "enemy combatant." The Department also submitted a declaration by Attorney General Eric Holder stating that, under executive orders issued by President Obama, the government is undertaking an interagency review of detention policy for individuals captured in armed conflicts or counterterrorism operations as well as a review of the status of each detainee held at Guantanamo. The outcome of those reviews may lead to further refinements of the government’s position as it develops a comprehensive policy. "As we work towards developing a new policy to govern detainees, it is essential that we operate in a manner that strengthens our national security, is consistent with our values, and is governed by law," said Attorney General Holder. "The change we’ve made today meets each of those standards and will make our nation stronger." In its filing today, the government bases its authority to hold detainees at Guantanamo on the Authorization for the Use of Military Force, which Congress passed in September 2001, and which authorized the use of force against nations, organizations, or persons the president determines planned, authorized, committed, or aided the September 11 attacks, or harbored such organizations or persons. The government’s new standard relies on the international laws of war to inform the scope of the president’s authority under this statute, and makes clear that the government does not claim authority to hold persons based on insignificant or insubstantial support of al Qaeda or the Taliban. The brief was filed in habeas litigation brought by numerous detainees at Guantanamo who are challenging their detention under the Supreme Court’s decision last summer in Boumediene v. Bush. "This is really a case of old wine in new bottles," the Center for Constitutional Rights said in a statement. "While the new government has abandoned the term 'Enemy Combatant,' it appears on first reading that whatever they call those they claim the right to detain, they have adopted almost the same standard the Bush administration used to detain people without charge -- with one change, the addition of the word 'substantially' before the word 'supported.'" First, the new version requires proof of “substantial” support of Taliban or Al-Qaeda forces, while the former version required proof of “direct” support of such forces. And, third, the new version applies to a person who “directly” supported hositilities to aid enemy armed forces, while the former version only required “support” of such hostilities, and did not include the word “armed” as to enemy forces who had been supported. These new terms are, as yet, largely undefined. "It is neither possible nor advisable to attempt to identify, in the abstract, the precise nature and degree of 'substantial support,' or the precise characteristics of 'associated forces,' that are or would be sufficient," the DOJ says in its memorandum. "Although the concept of 'substantial support,' for example, does not justify the detention at Guantanamo Bay of those who provide unwitting or insignificant support to the organizations identified in the AUMF, and the Government is not asserting that it can detain anyone at Guantanamo on such grounds, the particular facts and circumstances justifying detention will vary from case to case." You can download the full memorandum in PDF form here.